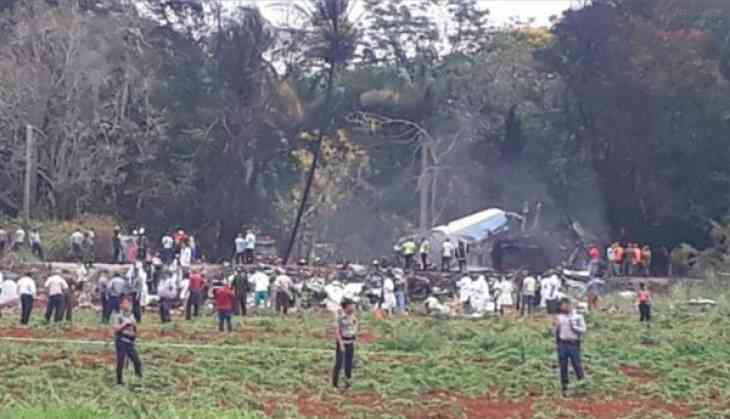 More than 100 passengers onboard Boeing 737 Cubana de Aviacion died after the plane crashed on Thursday afternoon soon after it took off from Havana's Jose Marti airport. As reported by CNN, three passengers are said to be in a critical condition. Further, a total of 104 passengers were said to be onboard. The plane embarked for eastern Cuban city of Holguin went down at 12:08 p.m. in an agricultural area in the Santiago de las Vegas neighborhood near the airport. A team of search and rescue personnel is working at the location along with help of some locals. Further, a photo has been circulated depicting a large plume of black smoke rising from a distance. The aircraft for Flight DMJ 0972 had been rented by the Cuban airline. Following the incident Cuban president Miguel Díaz-Canel arrived at the location. It was earlier reported that the flight was bound for Guyana. Earlier Cubana de Aviacion had to disown some aging flights due to their suspected malfunctioning. The exact cause of the recent crash has not been ascertained.